The purpose-built 800x600x150mm steel enclosure is fitted with twelve quick-fit docking stations to accommodate a mixture of available power modules. 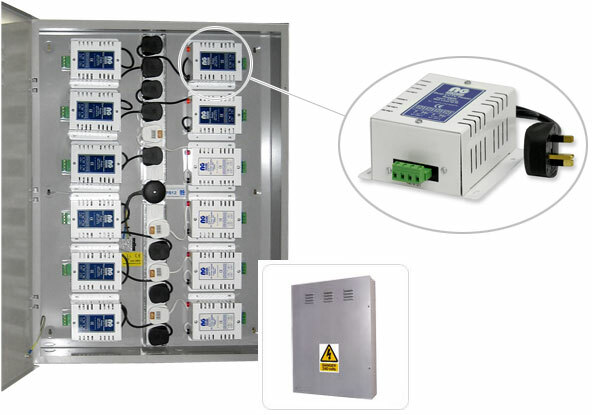 Modules are installed and connected in seconds, by push-on, screw-free retainers and simply plugging the UK-style 13A mains connector into the 12-way central power distribution block facilitates the mains supply connection. 12A, rising clamp removable output terminals allow for fiddle-free connections to the outgoing cable feeds, which may be routed through one of the four 25mm knockouts in the cabinet base. Standard dual and single AC and DC modules are available providing individual, isolated power outputs for up to 24 low-voltage cameras or ancillary equipment.